Tulip tables – everybody seems to want one – but no-one wants to pay the inflated prices of the retro design stores or eBay. 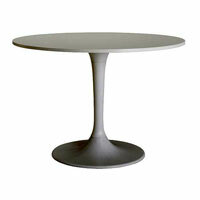 Enter Ikea with their tulip table for anyone on a budget, known instore as the Docksta. The Ikea tulip table (pictured) was designed by Gillis Lundgren, one of the first employees of the Swedish firm in 1959. And on the face of it, you can’t really fault it. But like most mass-produced copies, this table isn’t high quality – a fibreboard top (painted in white acrylic), with the base reinforced plastic wrapped around a steel leg. It’s not in the same league as the original, designed in 1956 by Eero Saarinen for Knoll, nor is it the same quality as the 70s remakes by Arkana. However, you’ll pay around £2,000 for a Saarinen and up to £350 for an Arkana – but the Ikea one is ready to take home for just £94.90. Saying that, you’ll still have to buy the chairs – and as no-one is remaking them for the budget market as yet, it’ll have to be vintage – and they don’t come cheap if they’re in good condition (around £300-£400 for a set of Arkana ones).